You have come a long way from televisions that were developed using optical, mechanical and electronic technologies to get an image and transfer it over distances to be displayed on screens. With time, the mechanical aspect was dropped and optical and electronic technologies could be more relied on. As early as 1936, the Olympic Games were conveyed through cable to the television stations in Berlin and other cities where people could watch the games live. That in itself was a commendable achievement, given the technology available at that time. It was much later in the late 1980s and early 90s that technology came up with LCD or Liquid Crystal Display that ensured sharper pictures with unbelievable crispness. The bulky and unwieldy television sets were replaced with slim light ones. The technology helped produce black and colored images by a special process that filtered light that was provided by several CCFLs or cold cathode fluorescent lamps. Though the pictures produced were brilliant, the technology was not very efficient and consumed a lot of power as only a small quantity of the produced light reaches the viewer and the major portion of it is blocked. The very first plasma display television was produced in 1992 by the Japanese company Fujitsu. It was a 21 inch full-color hybrid display. This was soon followed by Panasonic’s offering in 1994. Again in 1997 Fujitsu came out with its 42 inch plasma display that had 852 X 480 resolution and Philips followed with their 42 inch plasma display the same year. Around 2006 the LCDs outsold the plasmas in the larger sizes category. Until late 2000 it was the plasma televisions that were very popular because of the clarity and crispness. 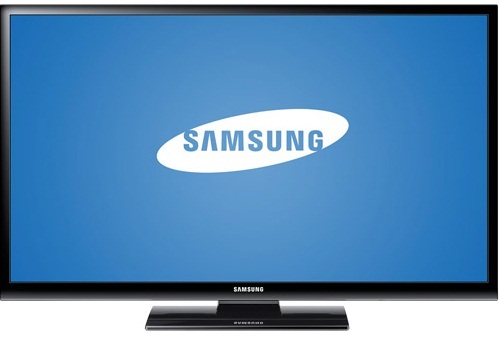 The latest offering in Plasma display televisions is the PN43E450 from Samsung. Competitively priced and proving it to be a great performer with the highlight being the vivid color. It is also known to draw less power than most other television sets in the same range. Just over an inch in thickness and in a sleek black finish, it has a real black panel. Armed with an Eco Sensor, it is mounted on a rectangular stand and does not have a swivel which is a minor drawback for the price you are paying. The 1 year for parts and 1year for labor warranties make it all the more attractive. The remote control is quite small and fits into your hand perfectly and is armed with a backlight that is really handy during the night or in darkened rooms. There are no smart features like Smart TV or other apps that high-end TVs costing a pile possess. A USB port is provided and playing movies or music of your choice is left to your choice. The large screen should especially be good to view favorite photos. This economically priced plasma display TV from Samsung has a resolution of 1024 X 768 pixels and is also equipped with a scaler that can process inputs up to 1080p.